Get one of our free pin-on buttons! Pose for a selfie with our signs! 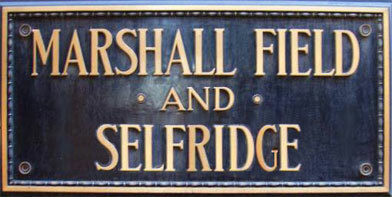 Chicago's best known international brand experience, MARSHALL FIELD'S! In the beginning there was Marshall Field's, a dry good concern that grew to be thirty-six acres of everything money could	buy (111 North State Street). [Marshall Field's] was sold to Macy's in 2005. Chicago has been in mourning ever since. How can one not grieve for an emporium--Field refused to call it a department store	--whose slogan was "Give the lady what she wants"? Even in New York City, it appears that they know it was a mistake to replace Marshall Field's with Macy's. Marshall Field’s was so many things on so many levels: world wide fashion and culinary trend setter; customer service leader; retail innovator; Chicago’s number three destination; an international name synonymous with Chicago at its very finest with something for everyone from the wealthy to the poor; and much more. In these difficult times, it is clear that we need a return to the corporate values that the store at 111 N State St. embodies when it is run in quality, service, and name as Marshall Field’s. The return of Field’s would be an exceptional antidote to these exceptional economic times. Your ongoing support & dedication to the return of Field’s at its best embodies what is needed in the world today. Our group continues to work hard to restore this icon’s distinctively Chicago quality, service and culture, as well as the name “Marshall Field’s.” Simply putting a “Marshall Field’s” sign on a “Macy’s quality” store won’t do. 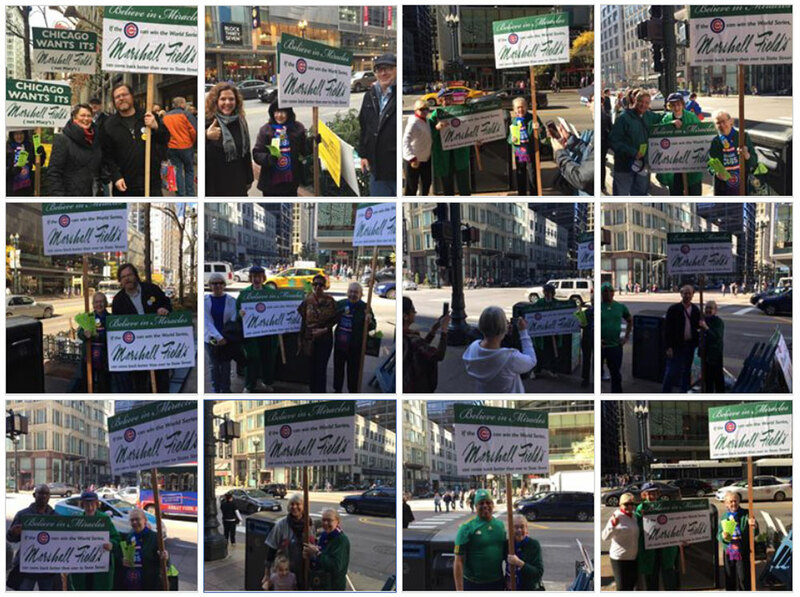 Among our many activities have been the distribution of over 145,000 buttons and lapel stickers and over 175,000 leaflets; the confrontation of Macy’s execs at the annual stock-holders meeting in Cincinnati; and rallies and letter-writing so as to sustain public awareness that Marshall Field’s can and should come back. For over 150 years, Marshall Field’s defined Chicago as an international city. More than just a department store and major tourist destination, Field’s set the standards for world-class quality in service, fashion, merchandise, food and culture. The world recognizes Marshall Field’sonce Chicago’s number three destinationas synonymous with Chicago at its very best. In 2006, Macy’s took away our beloved Marshall Field’s and made it one of over 800 Macy’s. Macy’s and Bloomingdale's are no match for Marshall Field’s! Our group is working hard to restore this icon’s distinctively Chicago quality, service and culture, as well as the name “Marshall Field’s.” Simply putting a “Marshall Field’s” sign on a “Macy’s quality” store won’t do. Marshall Field’s Can Be Brought Back! While Macy’s has disregarded tens of thousands of petition signatures and letters in support of Field’s, it is starting to listen to a sustained reduction in sales at former Field’s stores. 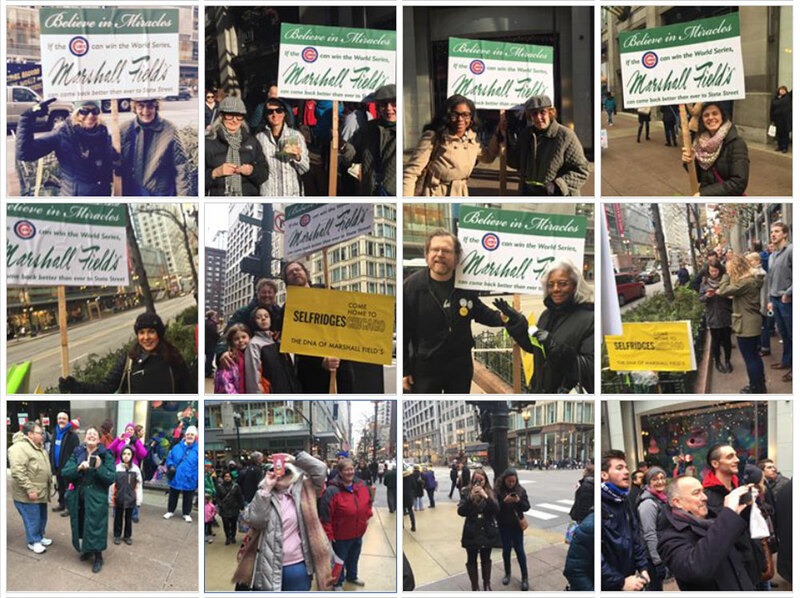 We urge you to send a message to Macy’s that Marshall Field’s must be brought back. The best way to do this is not to shop at Macy’s, Bloomingdale's, and Bluemercury until Field’s is revived. Macy’s must come to understand that former Field’s stores are only of maximum value when they are operated as Marshall Field’s in quality, service & name. Every dollar you spend at Macy’sand Bloomingdale’sis a vote against bringing back Marshall Field’s. Every dollar you spend at Carson’s, Crate & Barrel, Garrett Popcorn, Nordstom’s, Von Maur, Sears, Fannie May or any other store sends a mes- sage to Macy’s that it must bring back Marshall Field’s. We want Field’s! Please urge your family and friends to help bring Back Field’sBoycott Macy's, Bloomingdale's, and Bluemercury. Distributed on State Street & World-wide. 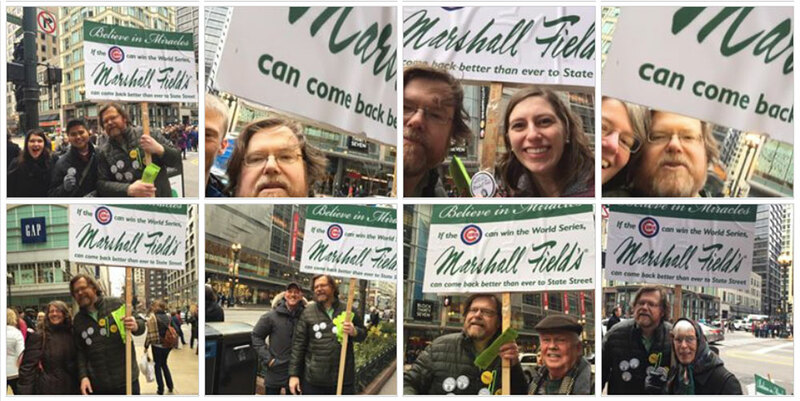 A couple of Field's loyalists thought it would be a great idea to stand outside this past Tuesday's special Oprah taping on Michigan Avenue and pass out "I Want My Marshall Field's" buttons and rally leaflets. 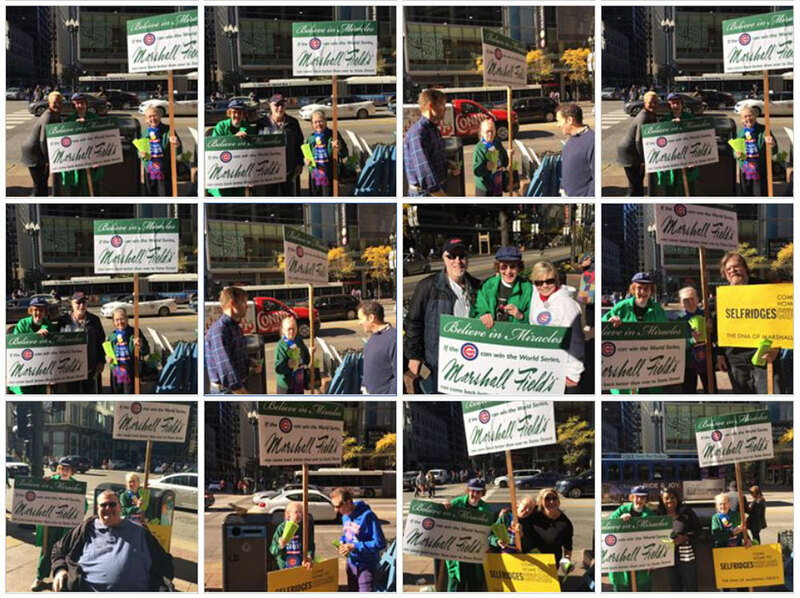 In record time of less than 20 minutes, 1,000 "I Want My Marshall Field's" buttons and 1,000 bookmark-style leaflets announcing this Sunday's rally were snapped up by the mid-day crowd until supplies were exhausted. Says Joe, "I was standing by the edge of the crowd, on the Michigan Avenue sidewalk and, started passing out leaflets and buttons. Those deeper in the crowd started waving their hands for buttons and leaflets. Twenty minutes later, all 1,000 buttons and 1,000 leaflets we had were gone!" 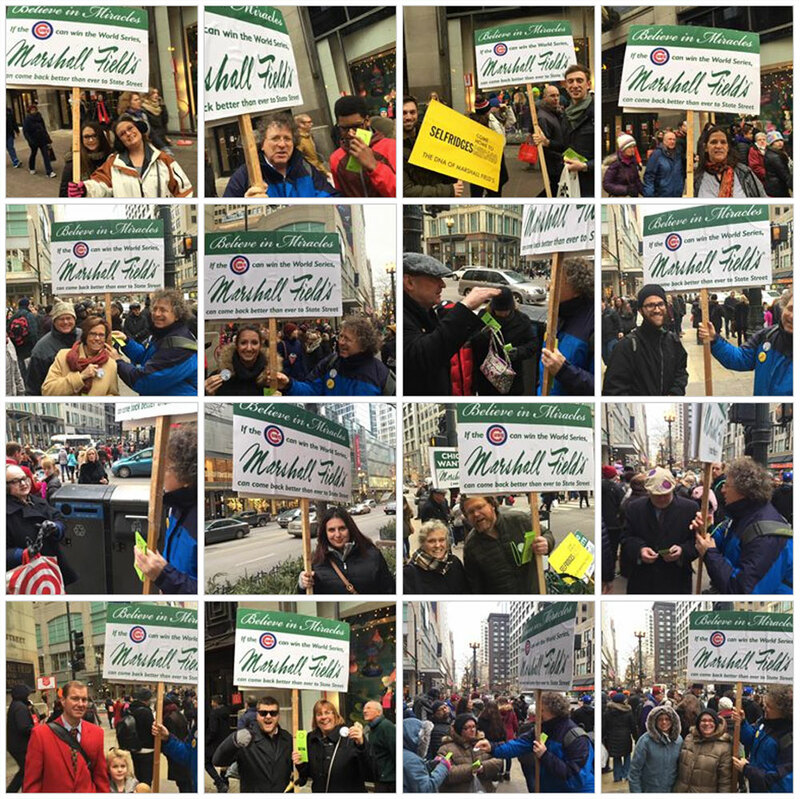 It sure looks as if Oprah fans want their Marshall Field's! Thanks to Joe, "G" and everyone in the crowd who brought back the thrill of Marshall Field's to the Oprah fans! For the record: FieldsFansChicago.org and its activities -- including the distribution of leaflets and buttons in the public right-of-way near the described Oprah taping -- are in no way connected to nor sponsored or endorsed by Orah Winfrey, her show, her enterprises and her associates. 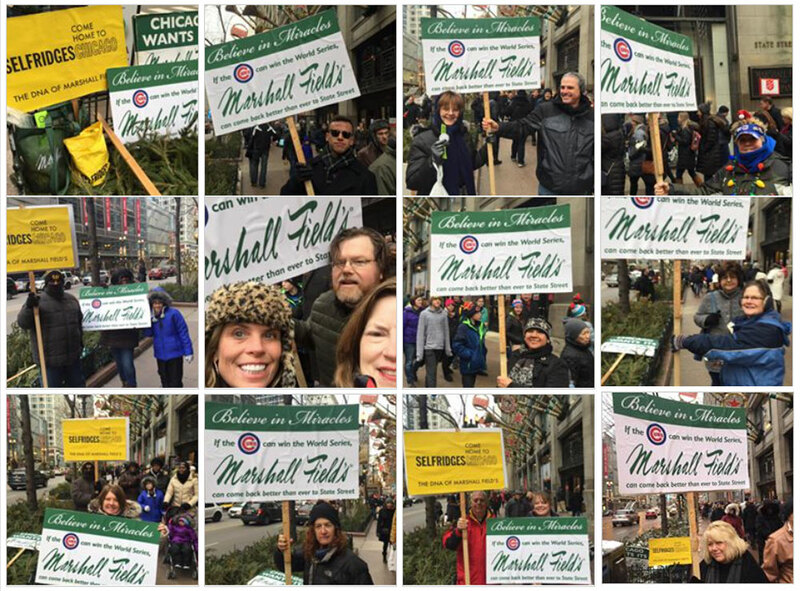 FieldsFansChicago.org organizers steadfastly maintain, "As we continue our grassroots efforts to bring back Marshall Field's in all its glory, it is good to keep in mind that in corporate America, anything can happen. After seven years as part of Daimler, Chrysler is again an independent American auto company. 'AT&T Wireless' became 'Cingular' only to reverse course back to 'AT&T'. Great brands, like the Ford Taurus, can be resurrected after much consumer demand. And CEOs can admit they've lost touch with giving their customers what they really want, as the CEO of Starbuck's recently did. With the widespread perception that the conversion from Marshall Field's to Macy's is a huge corporate blunder, we look unflinchingly to the future and keep emphasizing that although Field's is gone for now, it can indeed come back--just as Coke did when consumers rejected New Coke. It is only a matter of time until those visionary business and civic leaders with the needed clout come forward to do what needs to be done. 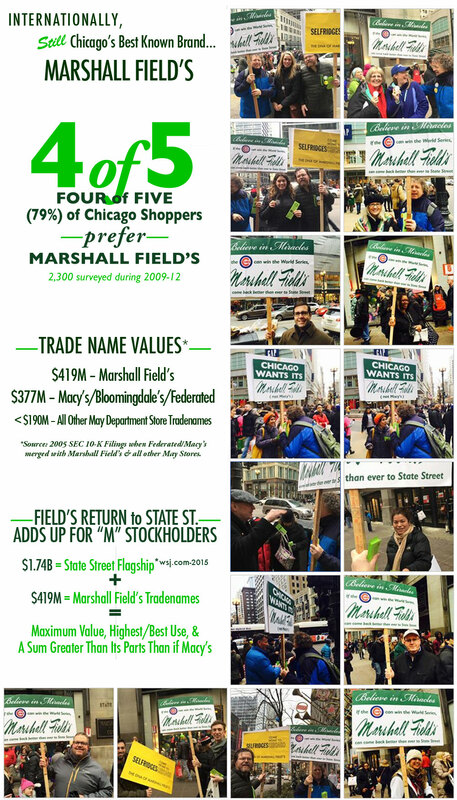 (CHICAGO, January 7, 2009) Thank you to all past and present who have done so much to help bring back Marshall Field's! Special thanks to those who helped make leafleting and button distribution on State Street a huge success in the past few weeks during the 2008 holiday season, especially Carol, Gail and Alfred, and, most of all, Gloria and Jon, who especially made it possible. 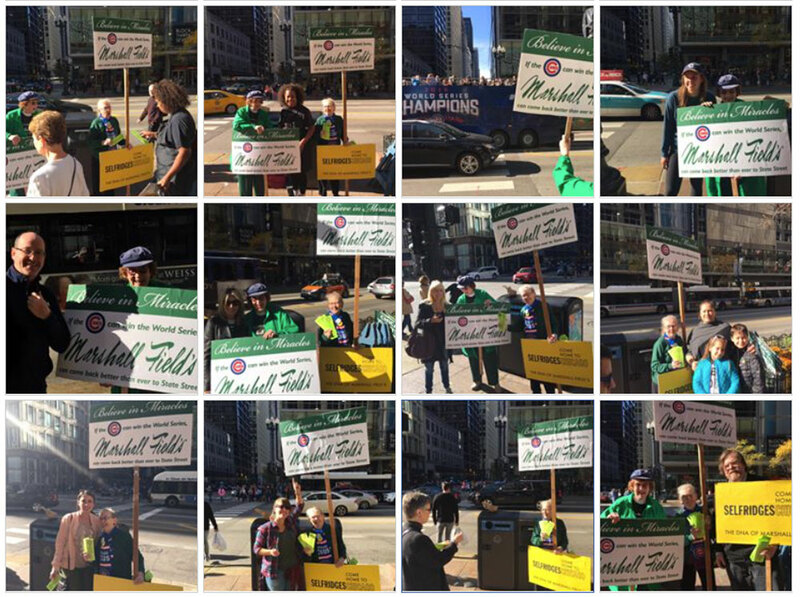 (CHICAGO, September 9, 2008) Roughly 50 Field's Fans took time from their busy work schedule, taking turns during lunch hour to rally in support of the return of Chicago's internationally renowned icon, Marshall Field's. Later in the evening, more Field's supporters came to hear forward-looking historian Joan Greene, author of Marshall Field's Food and Fashion: A Chicago Tradition. Ms. Greene gave a captivating and inspiring account of Marshall Field's local, national and international significance from the 1800s all the way through today. Please review details of our events for 9.9.2008. 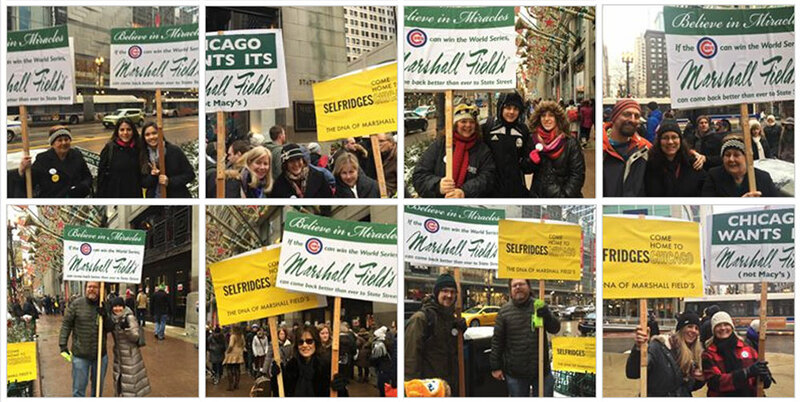 Those Wearing "Forever Marshall Field's"
Over 200 posed for over 120 "Selfies for Selfridges" in hopes that London's Selfridges Group could make a deal to restore Marshall Field's to State Street. 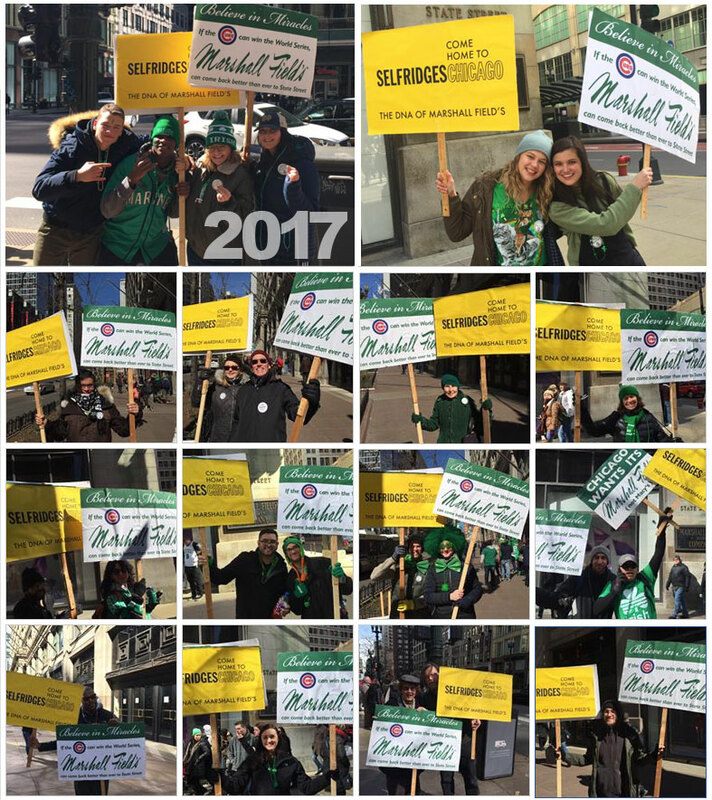 The grassroots organization FieldsFansChicago is stepping up its campaign to bring Selfridges back to Chicago and "Restore Marshall Field's." Specifically, the organization is working to lure London's Selfridges Group and the family of Canadian entrepreneur and philanthropist Galen Weston to make a deal to restore the international retail and cultural destination Marshall Field & Company back to State Street. Indeed, a whole new chapter in the story of Mr. Selfridge could be written. The grassroots organization FieldsFansChicago announces an independent campaign to bring Selfridges to Chicago. The campaign is named "Selfridges: Come Home To Chicago". Through the generations, the histories of two world-class, beloved emporia, Chicago's Marshall Field's and London's Selfridges, have separated and re-converged. With this as inspiration, FieldsFansChicago seeks to encourage the Selfridges Group to work with Chicago's citizens and civic leaders to establish an international retail experience in Chicago that re-captures the heart and soul of Marshall Field and Company that has been missing during the past nine years. 2014 Annual Fall Event a success! We extend immense thanks to DCASE/Chicago Cultural Center; IIT Community Affairs and Outreach Programs; and especially the Illinois Humanities Council for making "Marshall Field and Selfridge" a hugely rewarding and successful event. 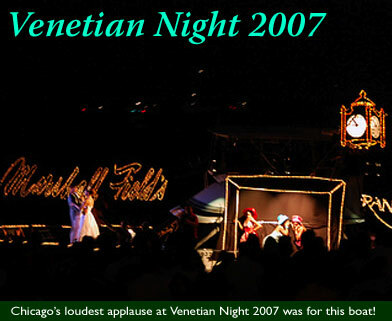 Thanks to all who made it a huge sucess! The latest survey of North Michigan Avenue and State Street shoppers completed between February and May indicates that 78% still want Marshall Field’s instead of Macy’s. Comparable surveys administered in 2009, 2010, and 2011 showed that 78%, 81% and 79% (respectively) preferred Marshall Field’s to Macy’s. As such, there has been no statistically significant change in the overwhelming preference of four out of five shoppers for Marshall Field’s. 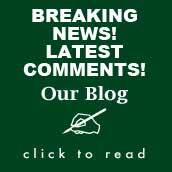 The results were related to Macy’s, Inc. CEO, President and Chairman, Terry Lundgren, and Macy’s Board of Directors immediately after the Macy’s, Inc. shareholders meeting held in Cincinnati, OH Friday, May 18, 2012. 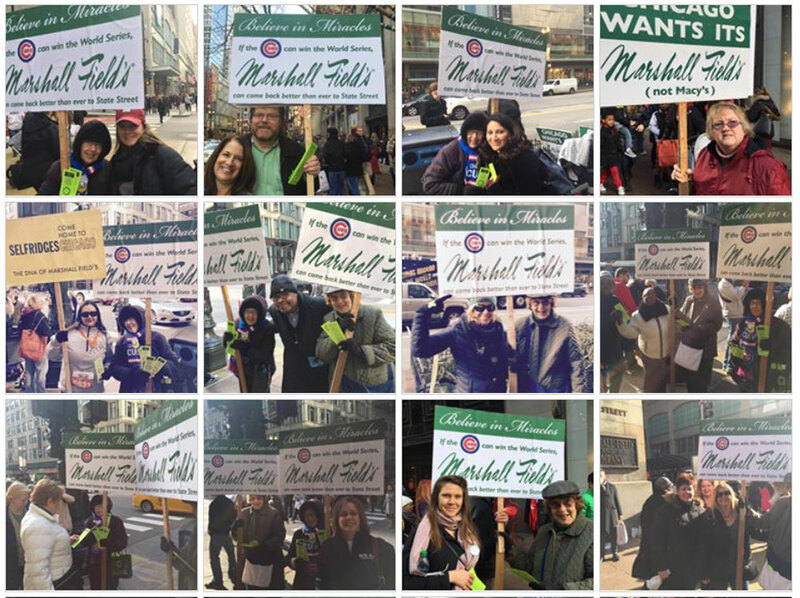 (CHICAGO, January 17, 2011) Thank you to all--past and present--who have done so much to help restore Marshall Field's! 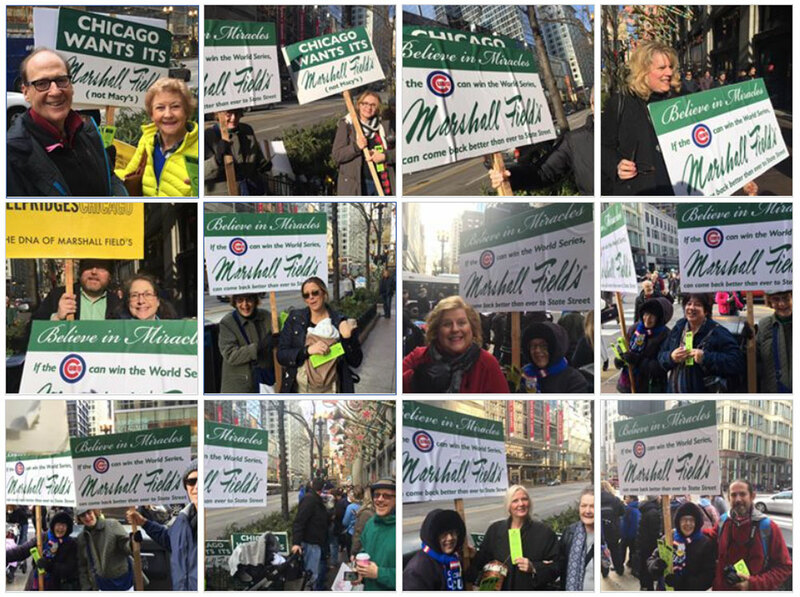 Special thanks to those who helped make leafleting and button distribution on State Street a huge success in 2010, especially during Christmas and the holiday season--especially Steve & Mary, John, Zelda, Gail, Cheryl, and Alfred, and, always, Gloria. About 70 Field's Fans cycled through our afternoon rally with a peak of 40 during the middle of the 50-minute-long event. 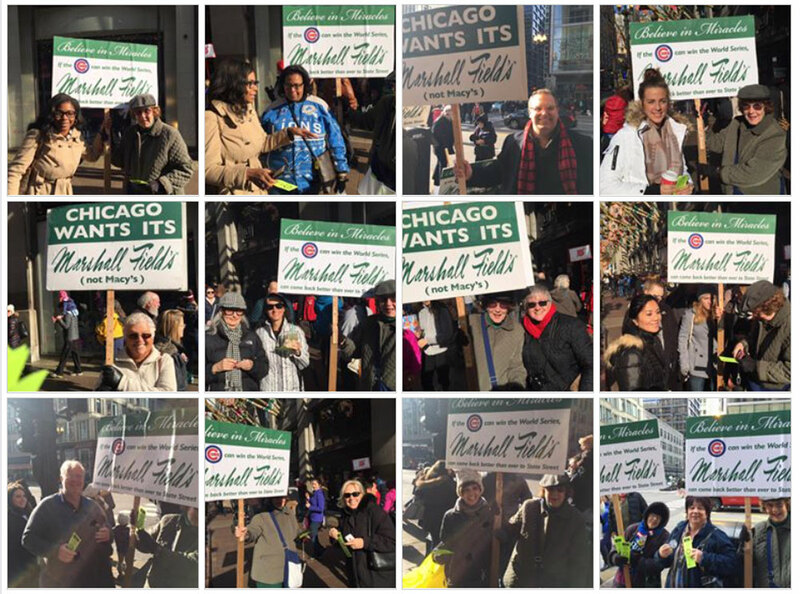 The rally was followed by an unveiling of an exciting new book by author Gayle Soucek covering the complete history of Marshall Field's, entitled Marshall Field's: The Store That Helped Build Chicago. Four Years Later, Survey Shows OVERWHELMING DEMAND for Marshall Field’s HOLDING STEADY: Four Out of Five Chicago Shoppers Still Prefer Field’s Over Macy’s. 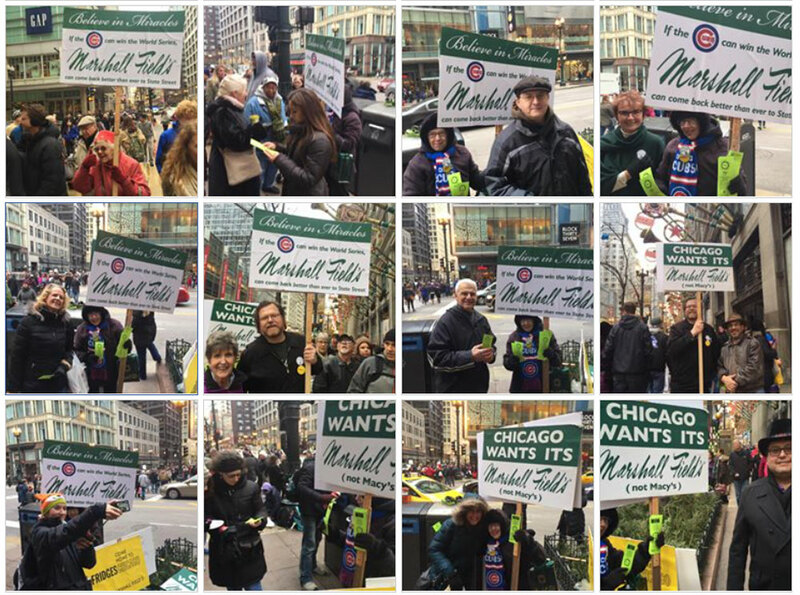 The latest survey of North Michigan Avenue and State Street shoppers completed in the past three weeks indicates that 81% still want Marshall Field’s instead of Macy’s. A comparable survey administered a year ago showed that 78% preferred Marshall Field’s over Macy’s. The results were presented during the “questions and comments” segment immediately after today’s annual Macy’s shareholders meeting in Cincinnati. Macy's, Inc., (M: NYSE), formerly Federated Department Stores, is the parent of Macy's and Bloomingdale's. 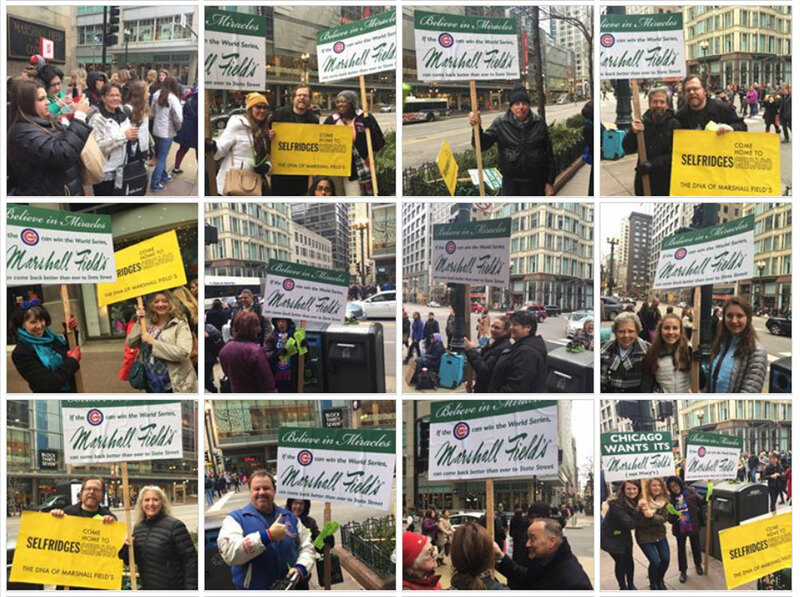 A four-minute, positively-spirited dialogue on the Chicago State Street store ensued between Macy’s CEO Terry Lundgren and FieldsFansChicago.org representative Jim McKay. A just-completed survey of shoppers in Chicago’s Loop and on North Michigan Avenue indicates that 78% still want Marshall Field’s instead of Macy’s. The survey of 522 shoppers was conducted anonymously by the grassroots organization FieldsFansChicago.org. Participants responded to three questions regarding their shopping habits at the Chicago store that was Marshall Field’s until 2006 when it was converted to Macy’s. Participants’ brief comments during the survey questions were also noted.  Download, print and distribute leaflets.  Sign up for our email newsletter. ©2005, 2006, 2007, 2008, 2009, 2010, 2011, 2012, 2013, 2014, 2015, 2016, 2017, 2018 All Rights Reserved.